Unt. 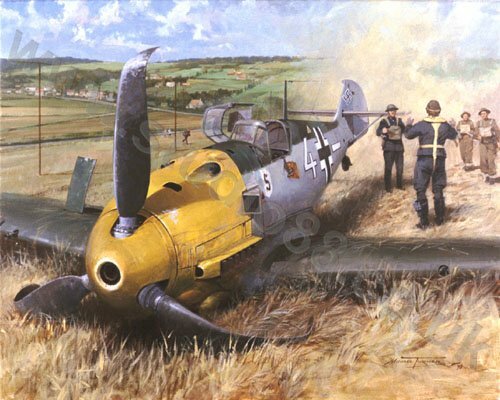 Horst Perez, the pilot of this Messerschmitt Bf 109 from JG26, surrenders to P.C. Walter Hyde and the local Home Guard after a forced landing near East Dean, Sussex, on 30th September 1940. Michael Turner's painting records the scene as the dust settles on that late summer day in the Battle of Britain, and this actual aircraft is now on display at the Imperial War Museum at Duxford.